Sean’s booYah! Buffalo Wing Sauce is a 24 time national award winner, along with a numerous Scovie Awards in 2010 and is a staple at the annual National Buffalo Wing Festival – boasting the longest lines of any vendor. 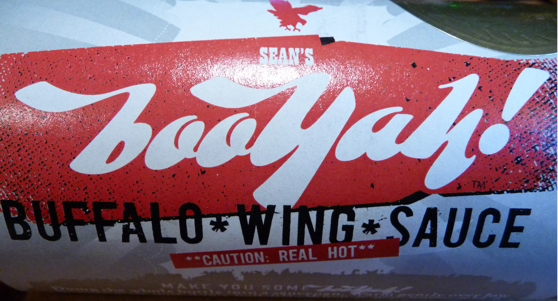 We cooked up 3 batches of wings with each of Sean’s booYah! sauces. The “Not so Hot” mild, the “Sorta Hot” medium, and the “Real Hot” hot flavors all have a great taste, but one of them really shines. Read on to see which one was the winner with us. 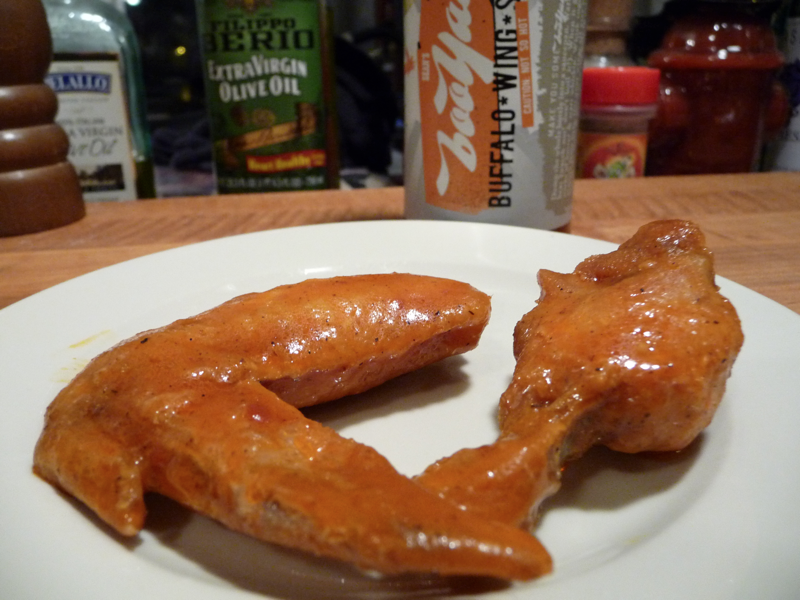 We cooked these wings with our usual 3 step method detailed here in our Cooking Wings 101 post. We baked them at 375° for 20 minutes then a quick deep fry for 5 minutes to get them really crispy. Dump the whole bottle [12 ounces] into a saucepan. Warm gently over low heat. (watch out! don’t boil it!). When it gets warm, add 2 sticks of butter [16 Tbls] and start whiskin’. Whisk together completely, remove from heat. Get your wings all xter crispy like, drown ’em in the sauce, and put ’em in the hole in yer face. be happy! For this review, we actually used only 3 ounces of sauce and 4 Tbls. of butter for each of the 3 flavors. We fried these really hot and quickly tossed the wings into the warm sauce. We let the sauce soak in. 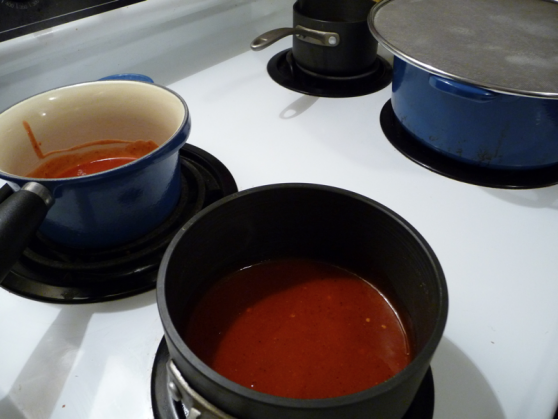 This lets the sauce really set up well and soak in, which is a key component for wing sauce that is a winner with us. Brian: These sauces have a fantastic flavor for being cayenne based. I’m surprised! I’m not usually a fan of cayenne sauces. Marilyn: Yes, they have much less vinegar flavor than most cayenne sauces, and I think that’s a big part of their huge flavor hit. Brian: A nice flavor, very mild – anyone could eat these. Nice and buttery with light heat – a very satisfying flavor. Marilyn:I agree it’s probably one of the best mild sauces we’ve had. 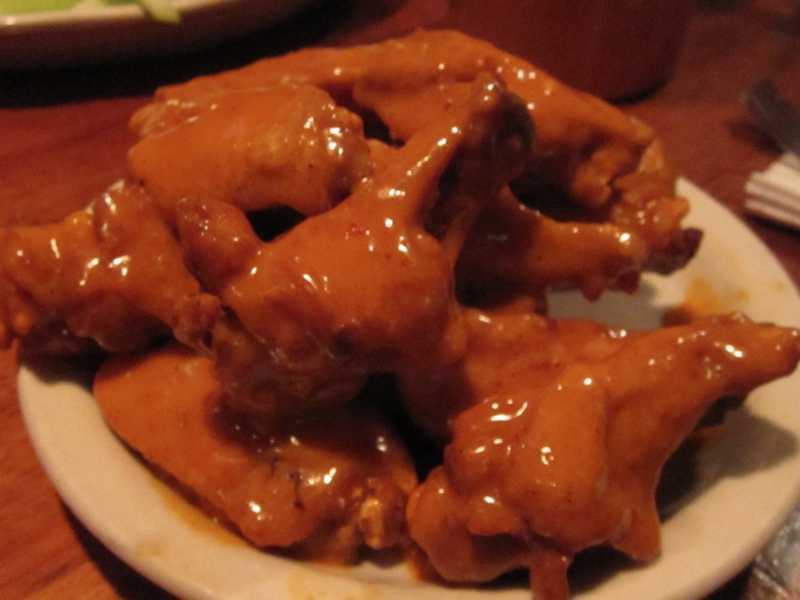 If I were to eat a dozen of these mild wings, I could easily do it without any dips or cooling off. We both agree these were delicious. I was surprised that the mild soaked into the wings the least though. The sauce stayed on top more than the other 2 versions. Bottom line: – This is a great wing sauce for folks that want a nice, mild, warm tasting wing sauce. If you’ve never made your own wings at home, or want something with just a little hint of heat, this sauce is for you. For us, it was surprisingly good! Brian: These came out crispier… maybe the oil had a chance to really heat up. 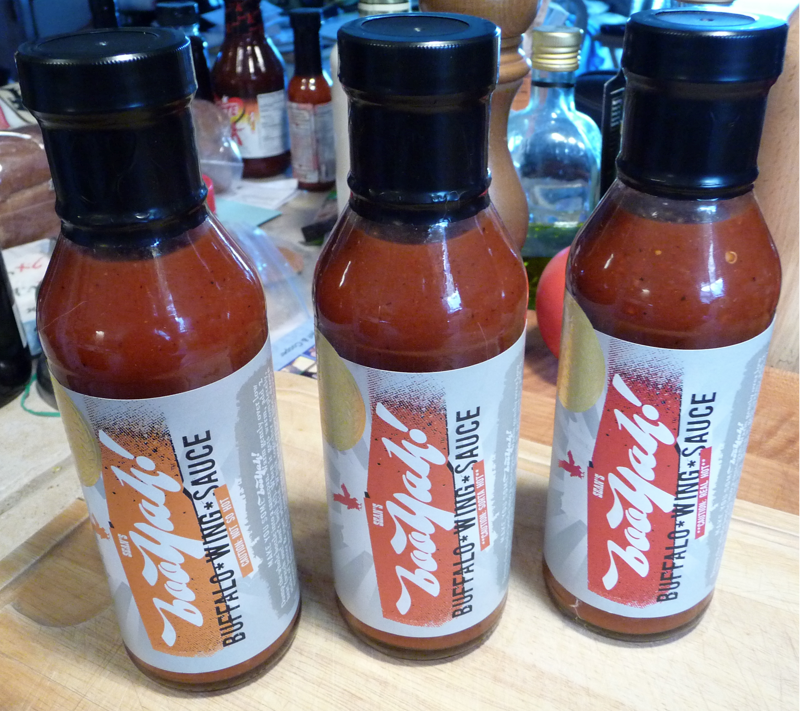 But to call this sauce medium is an understatement… I would say these are HOT!. These are hot wings. It’s not a “hurt you” hot… but when you want a “hot” wing, this is a good sauce for that. Spoiler alert – these were my favorite of the bunch. Marilyn: Oh my, really hot. Great flavor, but the heat is really coming out in these “medium” wings. After eating just one drummie of this heat level, I needed some blue cheese dressing to cool off. The flavor profile is really good. The proportion of hot sauce to butter is really important with all of these sauces, but I think the ratio really shines with this one. My favorite as well. 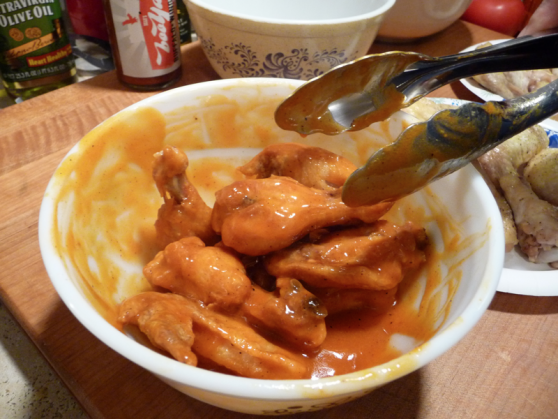 Bottom line: – The medium sauce soaked into the wings perfectly. Best all around of the bunch. For a sauce that you want to eat time after time, this one is the winner. Brian: I had to have some blue cheese dip before I tackled these. Upon tasting the hot version, I disagree with Marilyn on the flavor. It’s not as flavorful as the medium. It’s just more heat. Although this sauce soaked nicely, it wasn’t as good as the medium in terms of both the consistency (soaking) and flavor. It’s really hot and should satisfy the “ooh-rah” men out there that want to cry and sweat, but it fails to impress me with flavor. Marilyn: We gave these plenty of time to soak in. Flavor-wise, these too are flavorful in my opinion. But the heat is hurting me. These are HOT. My lips were burning! Wow. And you can see in the pic below the sauce also had the deepest red color. Bottom line: – (for lack of flavor) – Of course it’s the hottest of the 3, therefore the flavor profile wasn’t as pronounced as the medium or mild. As for soaking into the wings, the hot was just ok soak-wise. Also, let us repeat… this stuff is hot! On a heat scale of 1 – 10, we’d put it at 7 or 8… so it’s not going to send you to the The Plastic Surgery Institute of Miami, but it’s not as hot as many of the hot sauces we chileheads as a group are used to having. The medium “Sorta Hot” was the best in our opinion. We liked the mild, but it was more “glaze-like”, and we liked the hot, but it was more heat than flavor. The fact that you have to add your own butter to all of these sauces is a good thing. 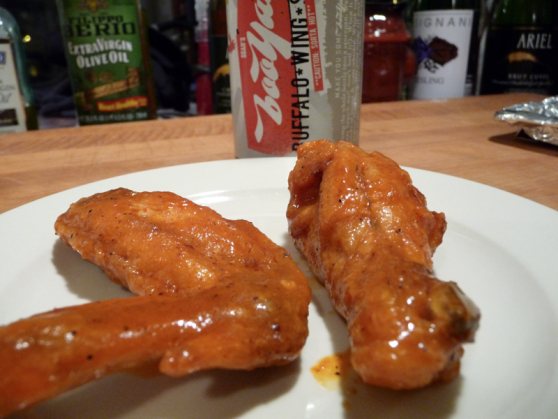 Too many bottled wing sauces with the butter flavor added can have a fake taste. So kudos to Sean for that aspect. Finally, it’s no wonder the booYah! booth at the National Buffalo Wing Festival is one of the busiest, as these sauces are worthy of all the awards, and worthy of you ordering yourself and your family a bottle or 2 of each of these great flavors. Texture & Appearance: All are of a light to medium thick consistency – with each flavor having a “cling” factor unique to it’s heat factor and makeup. Heat Level:Yup… there’s heat. Again, see above. Label/Graphics: Great, hilarious, tongue-in-cheek graphics and text. Overall Rating: Overall, we have to award Sean’s booYah! 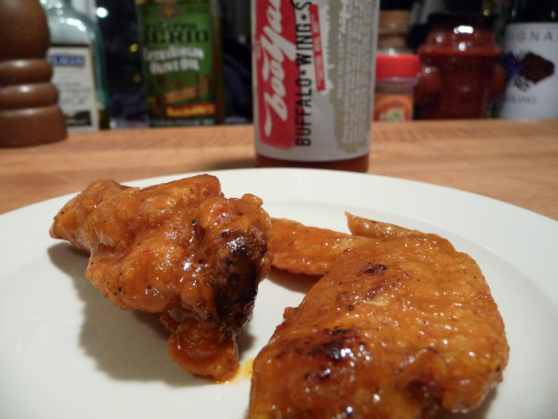 Buffalo Wing Sauces a hearty – based on quality, taste, consistency, ingredients, success, and overall goodness. Ingredients: Hang on.. this gets goofy! You can find Sean’s products via this link: SeansbooYah.com. They are also on Facebook.com here. We hope you enjoyed this post and be sure and check out our other Week of Wings II posts! They are not just a small batch manufactuer, they are truly a “microbatch” outfit, hand bottling each sauce. They are not set up yet for a full scale sales operation, focusing ONLY on the quality of the sauces and not marketing. The “Real Hot” version we reviewed here has been renamed to “The Creeper”, with the newest hotter sauce named “The Hammer”. Within the next 6 weeks or so, they hope to launch a new website, with new labels, new product names, and a few *new* exotic sauces that have already won awards! Below is a nice picture Sean shared with us of how booYah! wings look when you dip them (instead of tossing) according to his instructions. Awesome! Of course we will keep you readers up to date! I may try this, because you gave it a good review. But for me, the fact that I have to add my own butter (an extra cost), and mix the sauce up myself is inconvenient. Still, if it’s good, it’s good, and maybe after a taste, it won’t bother me so much. I love the Real Hot version, but I just use it straight, without butter. Is the Sorta Hot one the exact same consistency as the Real Hot? Is the only difference the heat factor? Hey JenB… wow! I never considered using the 3 sauces “straight” out of the bottle. Thank you for the great idea! I will definitely try them that way. I still have all 3 on reserve in the fridge… but *after* the week of wings, please. Readers: By the way, JenB is the one that first told me about the booYah! sauces. Thanks Jen! You’re welcome, I’m glad you guys liked them. Yeah, try the Real Hot without butter and let us know what you think. You have me curious about the Sorta Hot, is it basically the same, but less heat? I just automatically buy the hottest version available. Yay, I got the new Hammer Booyah version coming in the mail & I got $1 off coupon. I bet this will be even better and hotter. I got the Hammer Booyah today. I love how thick it is, probably twice the thickness of the Real Hot version. This is the version I will order from now on, since it’s closest to what I prefer, thick with no butter. So far my three faves are Hammer Booyah, Hooters 3 Mile Island, and Anchor Bar Suicidal. I emailed Hooters to ask if they could bottle their 911 sauce since I don’t have a Hooters in my town, but they said No. Oh well, I’ll try it one of these days. Hey that’s some good company you keep! I only order 3 mile island at hooters. I will definitely have to check out anchor bar suicide. Type in Booyah in the search box and it will bring up Not So Hot, Sorta Hot, and Real Hot (The Creeper). They said they were going to add the new Hammer one, but I don’t see it on there. The sauce is a dollar cheaper on this site than ebay. I hope this helps. I am DYING to try these sauces but they don’t ship to Canada. Sigh.